Not only are these sliders incredibly easy to make but they are also delicious. The sauce on top is the perfect addition and doesn’t mute, but instead enhances the flavor of the pickles and ham. It took a lot of self control to only have two of these for dinner. I could have easily been satisfied with a few more! You only need a handful of ingredients for this recipe and about 30 minutes of time to make it. I was able to stuff a 9×13 baking dish and had another (smaller) pan of 7 more so we will definitely have leftovers for a few days. It is the perfect dish for busy weeknights. This recipe was inspired by http://www.houseofyumm.com you can find the original post on their beautiful website if you would like to check it out. 1 (24 oz) jar of bread and butter pickles, I used a big jar because I packed on the pickles. If you want to use a smaller jar just go lightly on the pickles when you assemble the sliders. Cut all of the Hawaiian rolls in half. Place the bottom half of each roll evenly in your baking dish, reserving the top halves. Place the ham over the bottom halves of the rolls, next the cheese and finally the pickles. Place the tops of the rolls over the dish. Cover your dish with foil and bake for 15 minutes. Once 15 minutes is up remove the foil and bake for an additional 5 minutes to crisp up the tops of the sliders. Slice the sliders apart, serve and enjoy! Cut the zucchini in half lengthwise. To keep stability of the zucchini boat on your baking pan cut a little sliver out of the green flesh on the bottom side so that the zucchini will lay flat. With a spoon scoop out the seeded middle part. Set the boats aside. Stuff each zucchini boat with this beef mixture and place them on a greased baking pan. Bake for about 25 minutes. Remove from the oven and top with pepper jack cheese. Continue to bake them until cheese is melted. Remove from the oven once more and top with your favorite toppings. Once butter is melted add green beans into pan and stir to coat the beans with butter. Cover pan and reduce heat to low. I like my green beans a bit crunchy so I don’t allow them the time to go soft. I let them cook covered for about 7 minutes stirring occasionally. If you want them softer you’ll have to play with time but I estimate it would take 10 minutes or so. 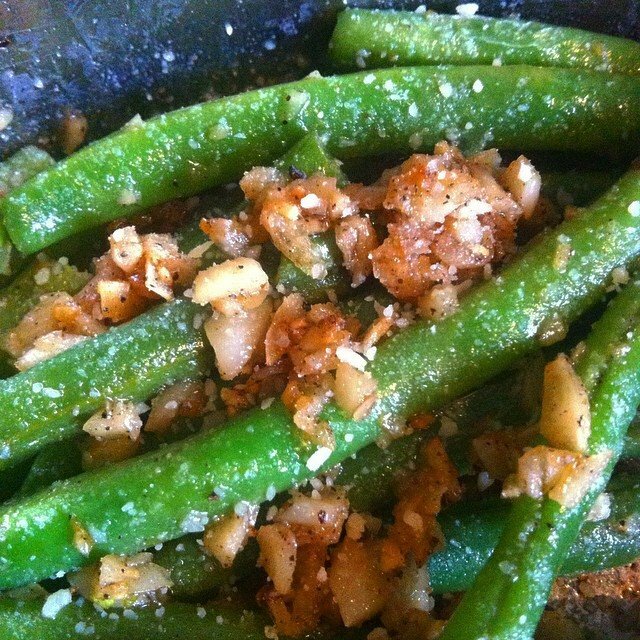 Once green beans reach your preferred texture, add garlic to pan and stir until caramelized. Do this over low heat because you are looking to caramelize not burn the garlic. Right before you serve the green beans sprinkle them with Parmesan cheese and salt and pepper. It only took one bite to know that this recipe would become a regular in my kitchen. 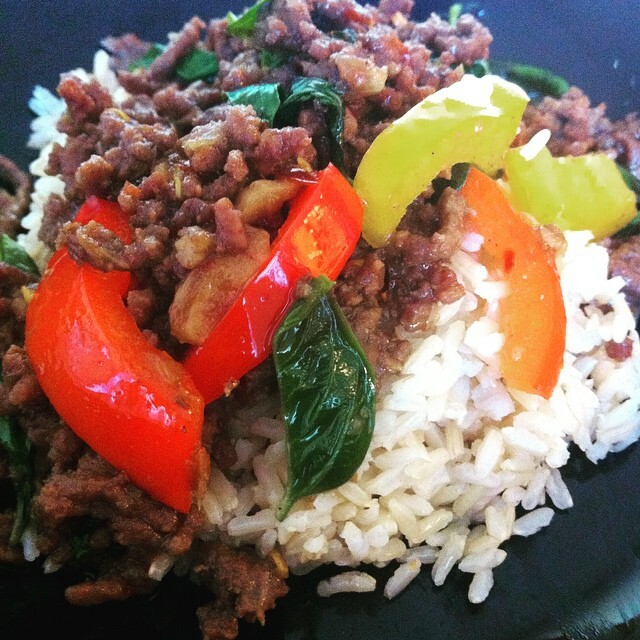 Traditionally Thai dishes don’t use ground beef but since I have two very busy little boys I needed to make it easy and affordable. Ground beef or beef strips, this recipe is a show stopper. The flavor is savory, spicy, and sweet. I think the fresh basil is really the highlight here. It adds a crisp fresh element that really blew us away. We spooned the beef over a mound of brown rice that added a nice chewy texture. We declared that from now on we will be doubling this recipe because two dinners just isn’t enough! If you’re serving with rice start cooking your rice now. Crush garlic with the flat blade of a knife. If you have a mortar and pestle you can use them to make a paste with the crushed garlic, pepper flakes and salt. If you don’t have a mortar and pestle continue using the flat blade of a knife and crush together the garlic, pepper flakes and salt to make a garlic-y paste. Once you’ve made the paste let it sit for a minute or two to allow the flavors to meld together. Heat oil in a large pan and cook the garlic paste with shallot for a minute over medium heat. Stir in your bell peppers. I like to leave my bell peppers still a little crunchy so I immediately moved onto the next step. If you like your bell pepper more soft allow them to cook for a minute or two before moving onto the next step. Add the basil and cook until just wilted, about a minute. Spoon beef over a bed of rice or other steamed veggies. OR eat it straight out of the pan, I will not confirm nor deny that I was tempted..
*Recipe is adapted from http://www.littlespicejar.com which is an adorable food blog with many many more delicious recipes! It is no secret that I love savory sweet, and this recipe delivers just that. 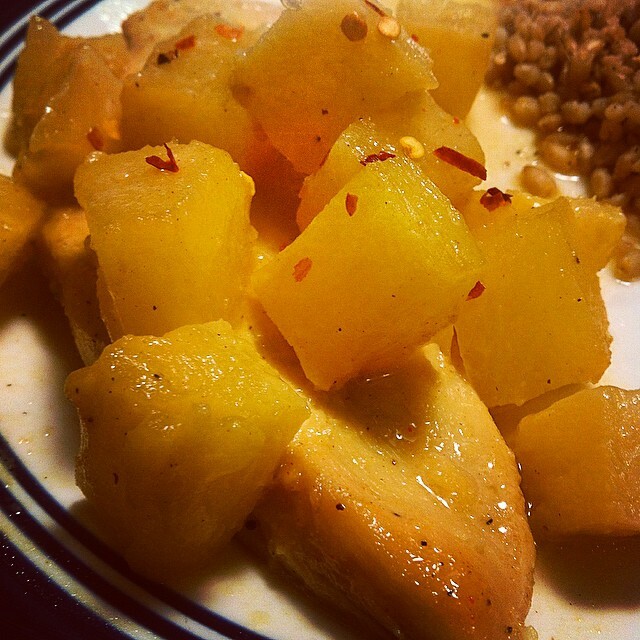 This chicken dish is baked so the meat came out really juicy and tender with the pineapples perfectly soft. I found it to be an easy, quick and delicious recipe that had us coming back for seconds. I honestly ate a heaping second plate of just the pineapple for desert, that is how tasty it was. We added extra pepper flakes for more heat and I think that took it to a whole new level of yummy. I’m falling in love with Dijon mustard after the saucy pork chops I made a few weeks ago, and I must say I think that is what holds all the flavors in this recipe together. To marinade, combine chicken, pineapple juice (drain from the canned stuff and keep pineapple chunks aside), garlic, salt, pepper, lemon juice, lemon zest and paprika. Place in a large bowl or ziplock bag and refrigerate for 4 hours. Pre heat oven to 400 degrees Fahrenheit. Spray 9×13 cooking dish with cooking spray. Remove the chicken from the marinade and put into the baking dish and set aside. Discard of the marinade. Pour the saucy pineapple chunks over the chicken and bake for 35-40 minutes. If you are into spicy, sprinkle pepper flakes on top before serving.